Operations. With headquarters in Seattle and regional offi ces in Alaska, Califor- nia and Texas, Global is positioned to provide project management, in-house engineering, marine and upland environ- mental services. Founded in 1979, our experience enables us to adapt quickly to unique problems and resolve potentially costly situations. How is the company different from when you joined in 1995? The most importance differ- ence that I see is that when the company was founded, there was a group of dedi- cated professionals who developed their respective skills during a time when both the commercial diving and marine envi- ronmental industries were themselves going through great changes. There was a tremendous opportunity for “on the job” training. There is a different expec- tation now from maritime clients; they desire professional tradesmen working on their projects and facilities. The entry level employees at our company have the basic skills to dive and work in the fi eld, but are having to invest in their professional development, specifi cally in construction trade skills such as weld- ing, fabrication, mechanical inclinations, rigging and vessel operations. These are truly the services that our clients expect from us, and not simply having the abil- ity to dive. How will your ascension have a mate- rial impact on the company? My job is to build upon the incredible foundation that is already in place, built not only by Tim and John, but by a group of experienced managers, support personnel, supervisors and fi eld crews. I think I bring a different perspec- tive on the overall opportunities that the company is capable of capitalizing on in the future; we have amazing depth and expertise in commercial diving, but we are at a point where we need to move beyond diving. It will always remain a core service that the company provides, but we need to move into new sectors of subsea services as well as providing a complete subsea experience for our clients. Our clients are desirous of more topside project management capabilities, as well as marine assets under our direct care. Looking at your overall business to- day, where do you see the greatest areas for opportunity, geographically and by sector? The domestic Gulf of Mexico market is a more short term opportunity for the company; we have a lot of room to grow in the offshore market since the opening of our offi ce in Houston in 2011. Our position in Alaska also has tremen- dous possibilities with the focus on the arctic. We also feel that there is a tre- mendous opportunity in the international market in our core strategic service lines. 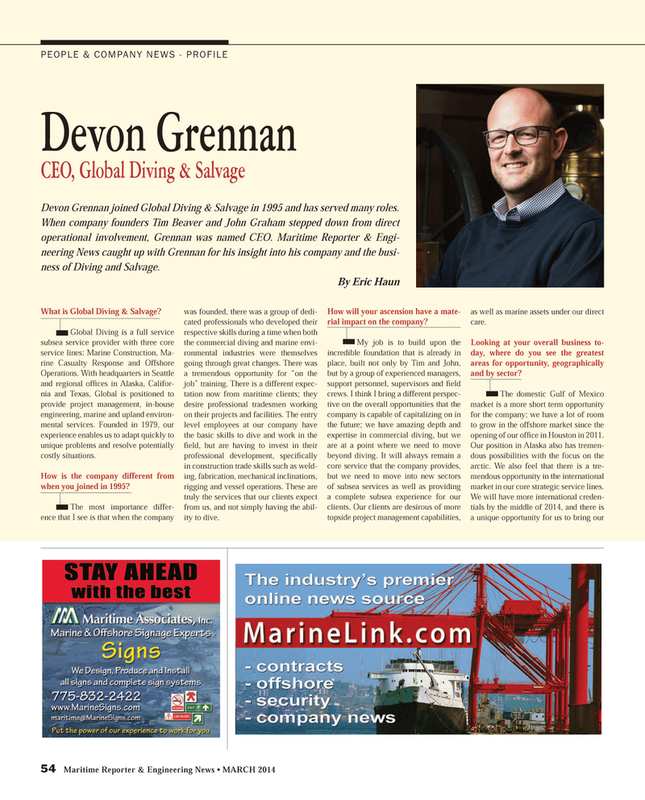 Devon Grennan joined Global Diving & Salvage in 1995 and has served many roles. When company founders Tim Beaver and John Graham stepped down from direct operational involvement, Grennan was named CEO. Maritime Reporter & Engi- neering News caught up with Grennan for his insight into his company and the busi- ness of Diving and Salvage.